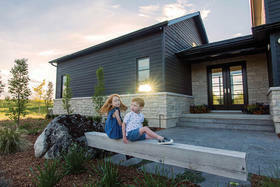 This young family is happy, healthy and living in an environmentally-friendly home they built. 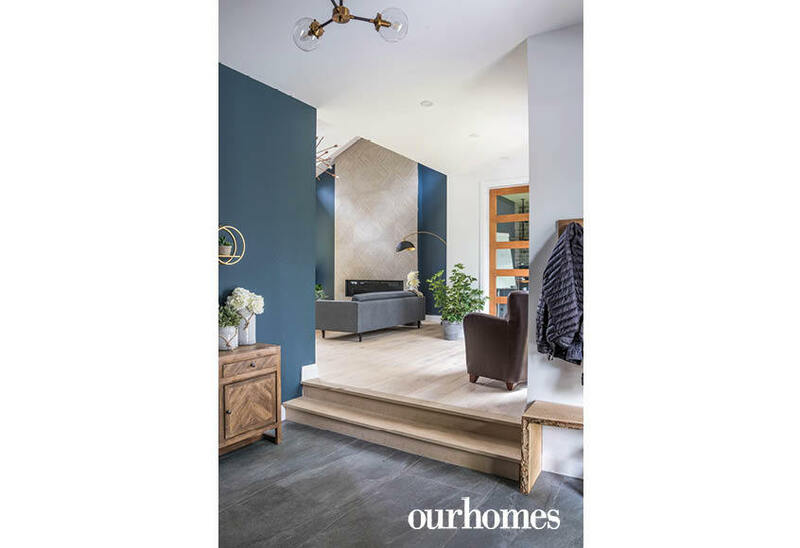 A version of this article originally appeared in the Holiday/Winter 2018/19 issue of OUR HOMES Barrie Orillia Midland Innisfil, p.50. Find local businesses in our Barrie directory. “We believe when you do that right, it’s good for the community,” explains Barrie resident and Obec Homes founder Jeremy Desota. 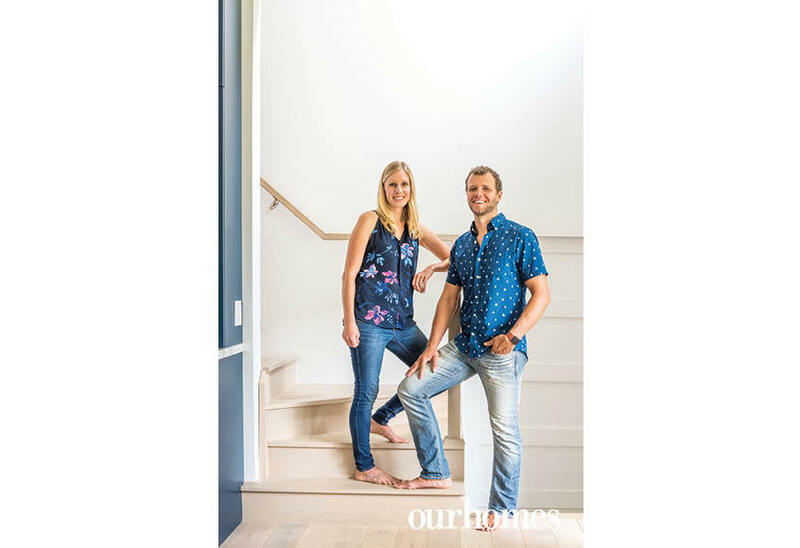 “People can funnel more of their money and time into relationships rather than funding the hamster wheel – which is what happens when houses are done to minimum basic code standards.” In 2017, Jeremy crafted an R2000 Net Zero Standard home for his family. Solar panels will soon be added to complete his sustainability plan. “Once those go up, we’ll have virtually no energy bill,” he says. Set in south Barrie’s Tollendal area, he and Carla, his wife of 10 years, were attracted by the 85-foot wide property that would allow a large vegetable garden in the backyard and plenty of room for their three young children to play. “It’s my peaceful place, for sure,” says Carla, who works as a health coach. The couple designed the home with spaces where their children could be children. Building supplies were sourced at Elmvale Home Building Centre. Automation is built into their house by Simcoe Audio Video, allowing things like the ability to turn off the household lights with a touch of their smartphones. Tucked strategically behind the mudroom is the large family room with the space and amenities to contain rambunctious youngsters. 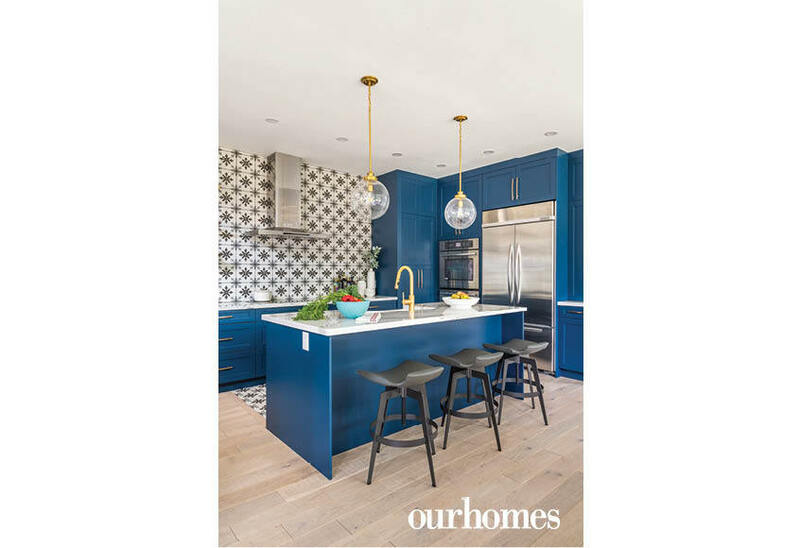 It also opens conveniently to the kitchen designed by Sheree Toffan of Designers Plus Kitchen & Bath, which also installed the kitchen, en suite bathroom, mudroom and laundry room. The kitchen boasts gold fixtures and cabinetry by Luxor Collection painted Benjamin Moore’s Gentleman’s Gray. The mist-stained engineered red oak flooring is inlaid with backsplash-matching ceramics from Tilemaster Barrie. Open to the kitchen and dining room is a living room presided over by a floor-to-vaulted-ceiling fireplace. Its intriguingly patterned tile facade negates the need for artwork, and its clean, straight lines are matched in the unadorned windows nearby for a sleek, modern style balanced by an all-natural view and abundance of natural light to create an inviting, yet serene, haven. 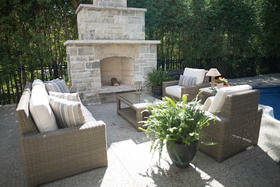 Upstairs, the master retreat features a private balcony overlooking the backyard. The neutral colours are enriched by the pop of blue on a wallpapered feature wall that backs up the bed and leads to the spacious bath and walk-in closet beyond. 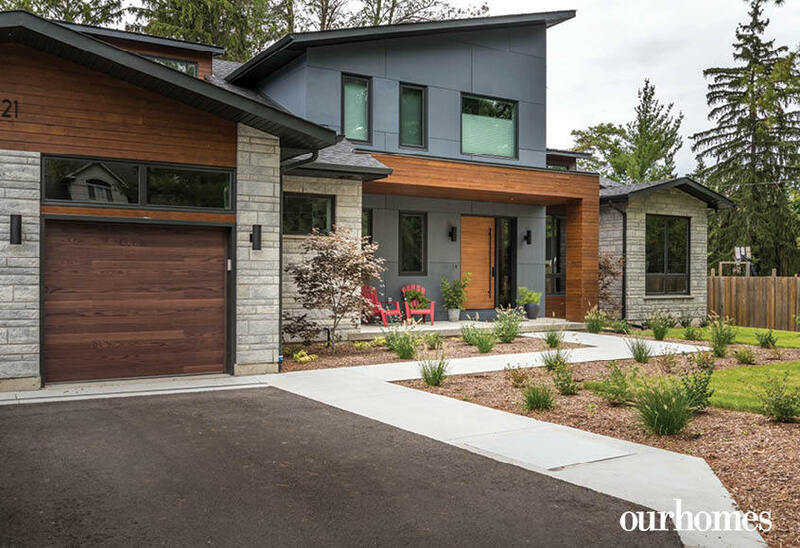 The exterior of this R2000 Net Zero home stands out in the quiet neighbourhood. 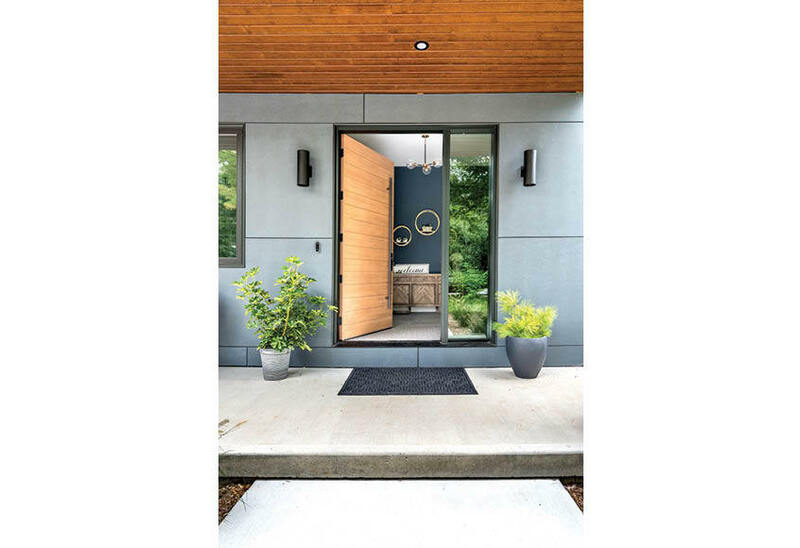 The intentionality of this home’s design blends wood, stone and concrete. 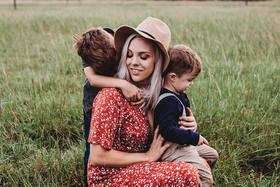 Jeremy DeSota of Obec Homes and his wife Carla are parents to three children. They stand together on the staircase off the kitchen that leads to the second floor. The foyer leads into the living room to the right and to the left, a family mudroom and playroom for Jeremy and Carla DeSota’s three kids. 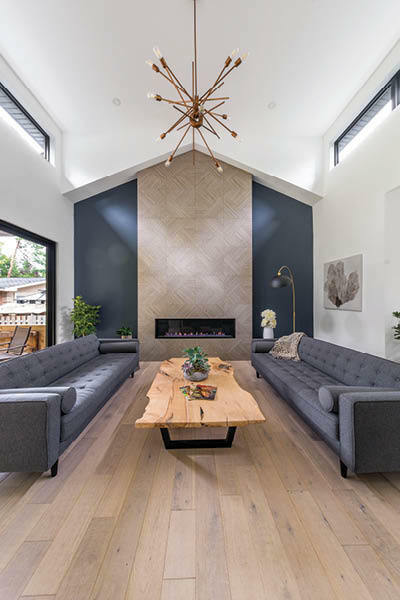 A linear fireplace with a floor-to-ceiling geometric, large-format-tile surround makes a statement in this living room. 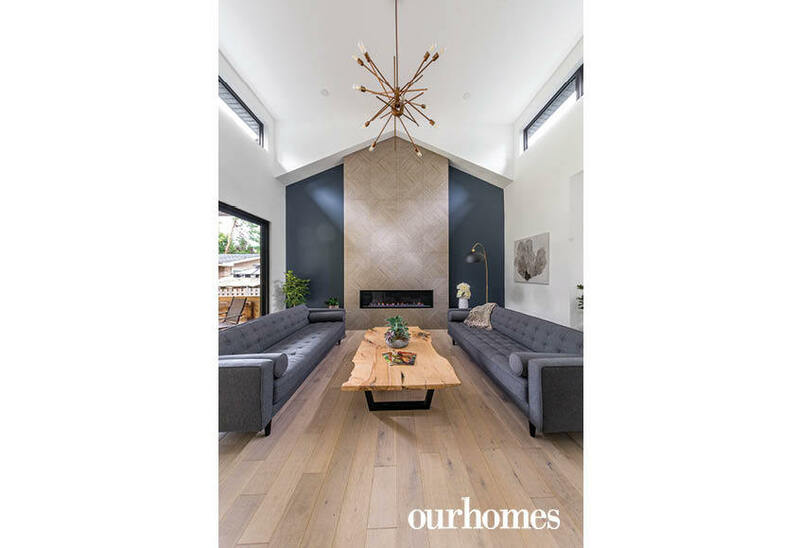 Blue walls (Benjamin Moore’s Blue Note) and long grey sofas ground the space, white a live-edge table brings an organic element. 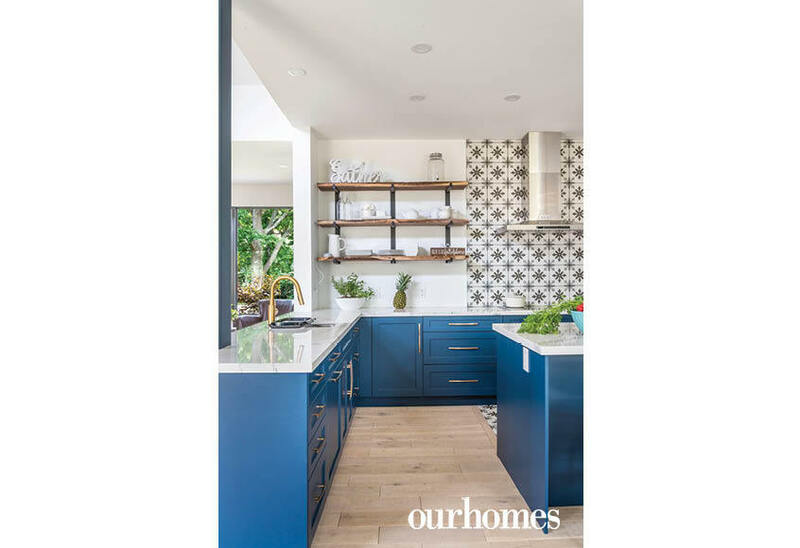 The corner cabinet of this blue kitchen disguises a walk-in pantry. 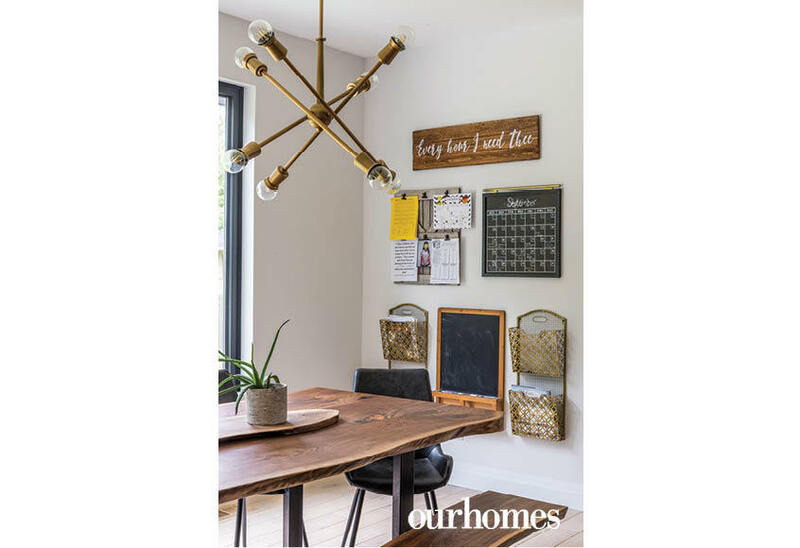 Gold and glass pendant lights shine. Black–and-white tile on the backsplash repeats as an inset on the floor. The blue cabinetry in the kitchen is fresh and elegant yet fun, in Benjamin Moore’s Gentleman’s Gray. 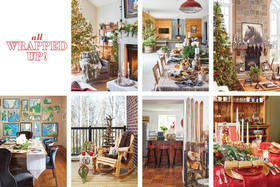 Open shelves offer a place to display treasures. 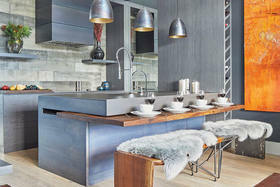 The gold faucet, pendants and hardware add bling to the kitchen. A tile backsplash runs to the ceiling and is accented on the floor in front of the range. 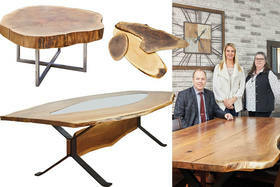 The family of five gathers daily for meals around the live-edge table in the dining area off the kitchen. The wall in this space is used keep everyone organized. The lighting throughout the home is exquisite. 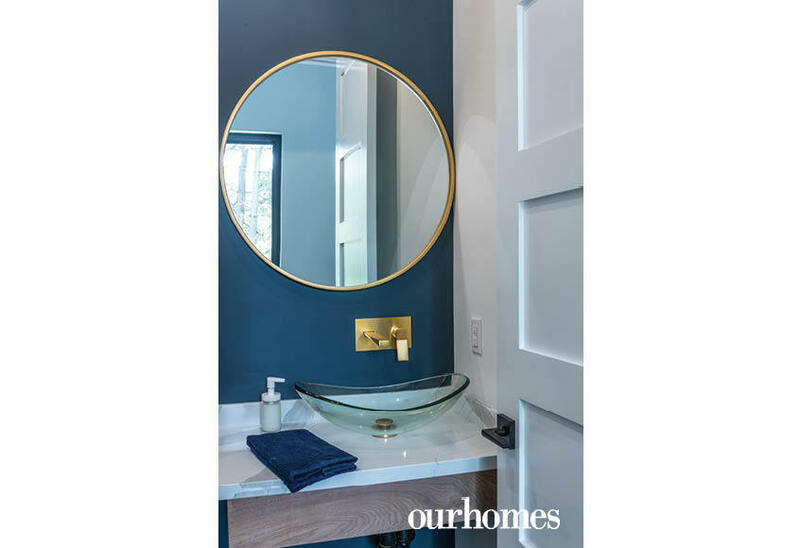 Gold is the chosen metal throughout the house, even in the powder room where it shines on the mirror and on the wall-mounted faucet above the clear glass vessel sink. The wall colour on the main floor is Blue Note from Benjamin Moore. A sunshine-flooded office inspires a tranquil mood. Designed as a workspace, it does double duty as a cosy lounge when it’s time for Saturday morning coffee. 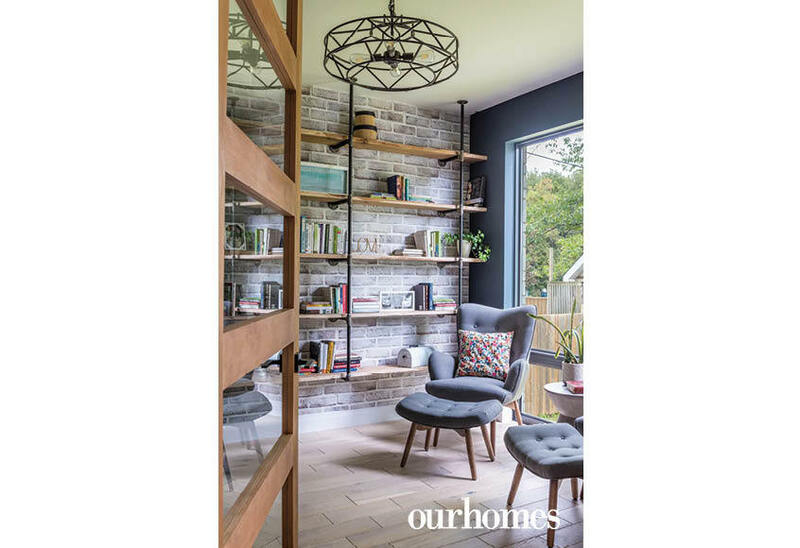 Faux brick wallpaper backdrops a custom walnut and plumbing-pipe shelving unit that captures the home’s industrial-meets-rustic aesthetic in a microcosmic vignette. 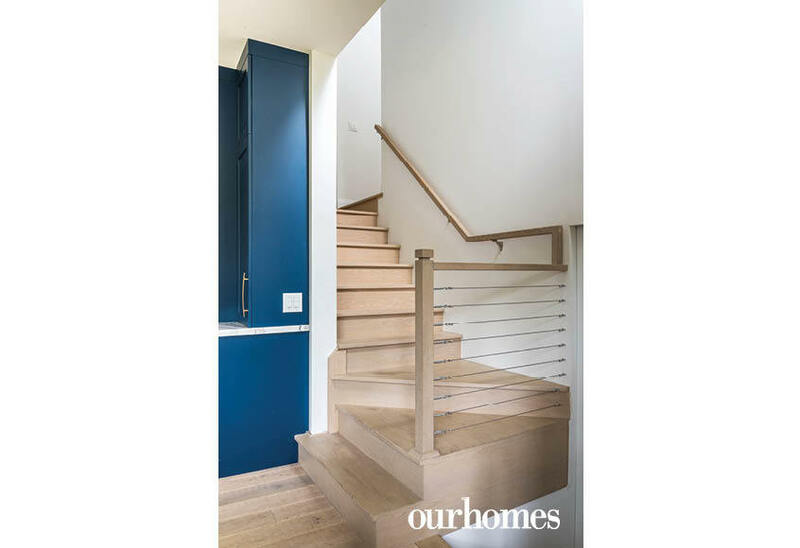 These stairs and the wood floors are made of red oak with a white-wash finish. 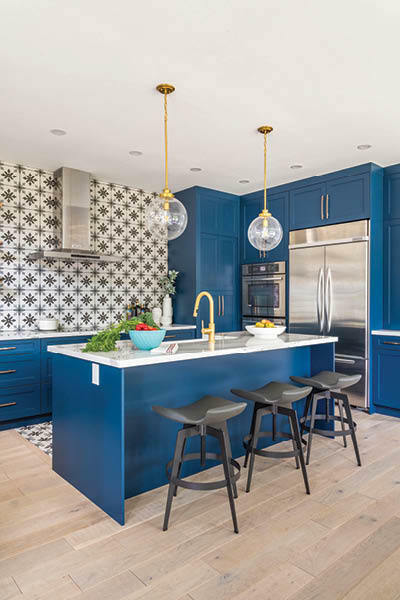 Blue is the accent colour of choice in this modern home. 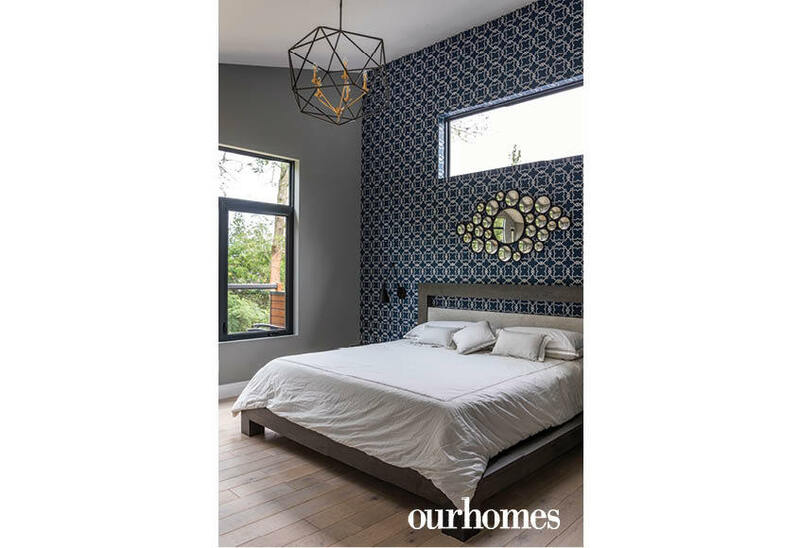 A bold wallpaper in the master suite plays off the geometric shape of the light fixture. A linear window and bubble-design mirror add a contemporary flair. The master en suite is stunning with a large walk-in shower next to a vessel tub. Black shower fixtures stand out against the large format marble tiles. 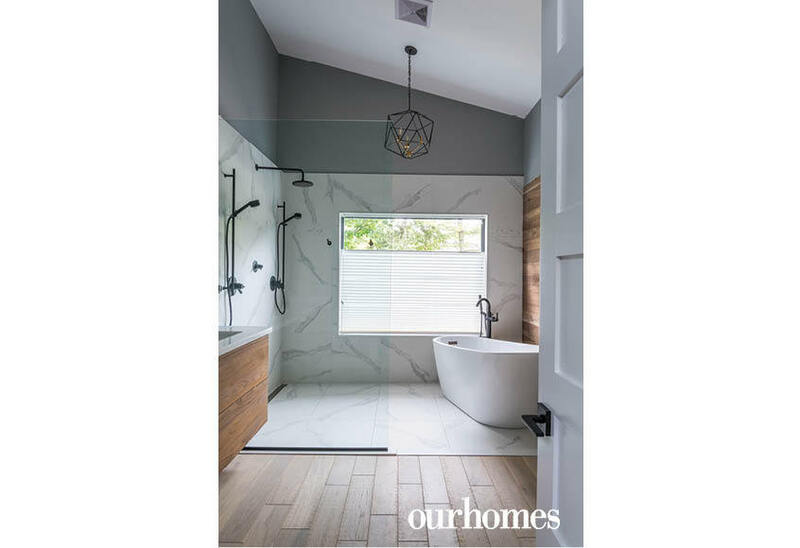 A quartz-topped floating vanity with a walnut front matches the floor and the wood-panelled wall.